Directed by Boo Ji Young. South Korea. 2014. 110 min. Korean with English subtitles. 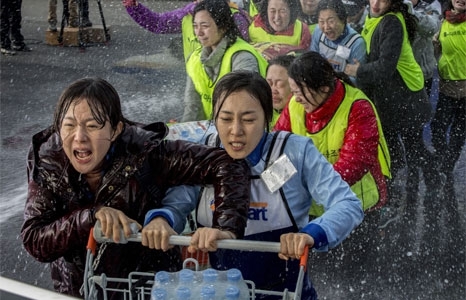 Based on a true story, the second feature from Boo Ji Young (Sisters on the Road) centers on the efforts of three very different women who take a stand when contract workers at a big box store are abruptly laid off. Sun Hee (Yum Jung Ah) is a middle-aged mother of two who works as a cashier alongside Hae Mee (Moon Jeong Hee), a single mother. Both are also friendly with Soon Rae (Kim Young Ae), a female custodian nearing retirement age, and junior manager Dong Jun (Kim Gang Woo), who is the only male representative of the store's labor union. The typically shy and passive Sun See, thrust to the demonstrations' frontline, discovers within herself untapped resources of determination and resilience—which has an unexpected effect on her relationship with her estranged son, Tae Young (played by K-pop idol D.O. in his screen debut). The workers, too, attain a deeper understanding of their situation, coming to realize not just their precarious position under the rule of their corporate employer but also the power they can wield by taking a mutual stand.